When two people, one Christian and one non-Christian, reference God are they referring to the same God? If a Muslim says "Allah be praised" and a Christian says, "praise God!" are they referring to the same God? If one thinks it is the same God, it appears that one would have to lower the differentiation between the two religions. If one says that the references are completely separate, then is it at all possible for an unbeliever to refer to the Christian's God at all? 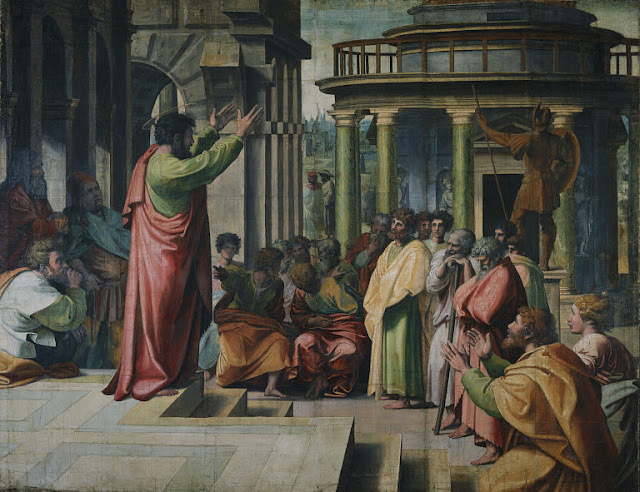 In his speech to the Athenians, Paul refers to the Athenian temple to an unknown god. And what the Athenians deem to be unknown, Paul proposes to declare (or make known) to them. In this case many have argued that Paul indeed thinks that the unbelieving Athenian god is referring somehow to Paul's God. However, Paul continues by presenting a stark contrast of properties possessed by the god of the Athenians and his own God. In his concise summary of the Old Testament, Paul says that God created everything, is Lord of all and providentially provides everything for his creation. In contrast, the Athenian gods are created by human minds and dwell in temples made by human hands, made only from temporal materials. Paul attempts to demonstrate that not only are the terms "god" and "God" referring to different entities, but that it is Paul's God is who makes it possible to refer to anything, worship anything and build any temple. By implication he is saying that even the term "god" is borrowed by the Athenians (for example, in their poetry) in order to refer to an idol. In other words, God (Paul's God) is the necessary condition for human beings being able to speak of idols, build their temples and worship in ignorance The Athenians merely use what they have been given by God against him in unbelief. It is this act, Paul says, that, though overlooked up to now, will be judged by God. Applied to our own context, the reference "god" in multiple religion is not referring to the same being. However it remains possible for people who are not Christians to refer to the Christian God. They do so because they already know God even while they suppress this knowledge (Rom 1). It also remains possible for unbelievers to refer to idols as "gods" since they are able to use their knowledge against the Christian God. Nice. I'm so amazed that after all these years of looking and meditating on Romans 1, the implication of that chapter is huge!